At 2:32 p.m. Pacific Time on Nov. 1, workers at the San Onofre Nuclear Generating Station in California smelled ammonia in the south end of the Unit 3 turbine building. The leakage was traced to a storage tank adjacent to the turbine building. The leak was reported to the control room and announcements were made over the site’s public address system advising workers to stay clear of the turbine building. NRC inspectors performing baseline radiation safety inspections responded to the Main Control Room and Technical Support Center. John Reynoso, the resident inspector, was offsite and responded to the site to monitor the scene of the leak near the Unit 3 turbine building. (Resident inspectors are assigned to all nuclear power plants so that the NRC has “ears and eyes” on the ground.) Within minutes, the station manager declared an “Alert,” because some vital areas within the turbine building had become inaccessible. An Alert is the second of four emergency declaration levels and is declared, according to NRC regulations, when events could involve an actual or potential decline in the level of plant safety. Further investigation revealed the storage tank was leaking ammonia at the rate of about one gallon every ten minutes. Workers were able to stop the leak by 5 p.m. The Alert was terminated shortly after 6 p.m. Both units remained stable and operating at full power. No radiation was released. There were no personnel injuries reported, and all leakage was contained onsite. 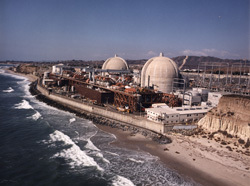 But it was the first Alert declared at San Onofre since 1999, when a suspected pipe bomb was found on the freeway nearby. As might be expected, it generated intense media interest, with coverage in 473 different venues overnight, according to a Google news search. The NRC resident inspectors will review the licensee’s response to the event, including the promptness of their efforts to stop the spill and corrective actions taken to prevent recurrence. Ammonia is used to clean filters that help purify water before it is sent to the plant’s steam generators. These produce steam used to turn the blades of turbine generators, producing electricity. Why would a nuclear plant have ammonia? The only reason I could think of would be refrigeration of something but could that not be something else. Unless this happened in a janitor’s closet. Actually, the media does report ammonia leaks. In our area, we have a fish market called Wholey’s. About every 2 years they have an ammonia leak because the place is old and they use it as a refrigerant. They often have to evacuate the area around Wholeys but the next day, everything is fine. I think it is less a ‘green agenda’ than simply a way to make money. Sensational stories generate revenue. If/when the public ever comes to view these with a yawn, they will disappear as stories. I think the NRC review of what happened definitely puts it into perspective. I just don’t know how much of this reaches the public. Incredible­. Its a toxic chemical. Its 25 gallons. They moved everyone away from the area as a precaution­. There is nothing more to this story. I don’t see people getting up in arms every other time a few gallons of any toxic chemical get spilled. Other then this happening on a nuclear site, this has nothing to do with nuclear anything. Please, in all fairness, I want everyone here to report to the world every time they spill some Windex, or bleach, or their AC in the home or car leaks. Don’t forget to report when the oil pan in your car starts leaking to the EPA. Regulation­s are there to protect the public and the environmen­t, not to cause a panic every time some ammonia spills. SONGS followed procedure and reported the spill. I am amazed people don’t have more heart attacks based on how worked up they get over inconseque­ntial events. These kind of peripheral non-nuclear related mechanical events can’t much reassure the (media-generated) public perception that all nuclear reactors just can’t wait to pop a leak like a balloon and “blow”. Why can’t the NRC and the atomic industry proclaim these sort of “obvious” non-reactor related incidents as “Non-nuclear Incidents” from the get-go? It’s a good bet that if it’s happening in the turbine building or the cafeteria that the reactor itself is not the guilty party. You KNOW the media can’t wait to jump even at a reactor worker sneezing to alarm a jittery scientifically unenlightened public (for their own “green agenda reasons”) that “something’s the ‘matter with the nuke”.